Saturdays are unpredictable around here. They can be packed with activity.... or they can be days when the boys never get out of their pajamas. The last few have been the kind where everyone is lying around (well, the kids, that is) while my husband and I get in a morning run, fit in house chores, and carry on with our normal lives. I usually make a special breakfast, first thing. This morning was no different. It's amazing what you begin to consider normalcy. For example, it took THREE times to get the coffee made correctly, because my filters are all goofy and kept folding over, allowing the coffee grounds to seap through into the pot. Ew. I woke up with a muscle cramp in my neck, and that's just downright annoying. Ellie (the big puppy) has been sleeping in our room, and she figured it was like any other morning, so from 6:00 on, she rattled and bounced around in her crate, just sure that if she did so long enough, we would let her out. Haha, fooled her! It was about that same time, that I heard my door creak open, and saw my little boy's face peeking through. He whispered, "Mommy, remember you told me last night we could read this book?" Ah, yes I had. Just after I'd tucked him into bed, he reappeared in the family room, asking if he could get his library book out of his bookbag, to look at before he fell asleep. He BEGGED me to read it to him, and I promised I would do so, first thing in the morning. It was too late, and he needed to rest. So, back to bed he went, book in hand. Of course, he did not forget. The sun was up, and so was he. Into my bed he climbed, smile on his face, sleepy eyes and all. 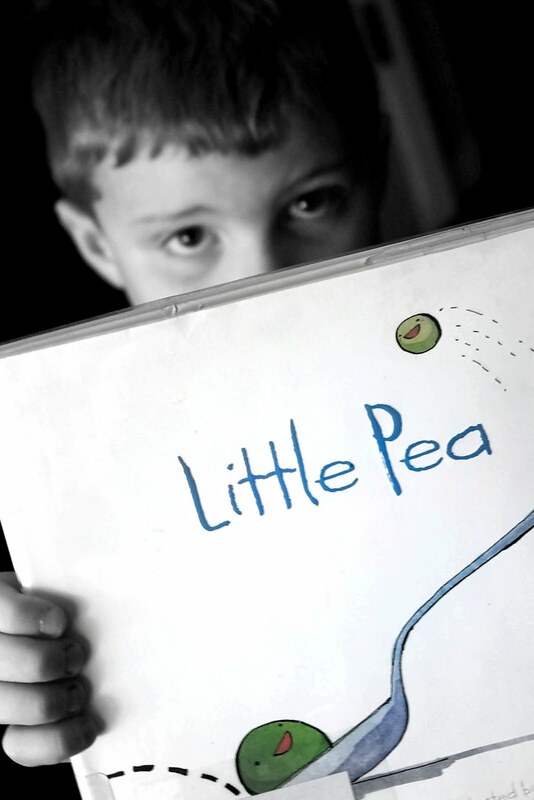 And we read "Little Pea." Little Pea has to eat candy for dinner every day, but he doesn't like it. We talked about how silly that would be. My son also explained that he just loves this book, and is bummed that he won't be allowed to keep it. (Apparently, the rule is that you have to check out a DIFFERENT book from the school library each time.) Then we talked about what dreams we'd had the night before. And as he commonly does, out of nowhere, he decided to remind me, "Mommy, I love you." Yes, sweet normalcy. I am so blessed. TWo things I love about this post.. the photography skills (seriously cool!) and the little boy. Perfect picture!